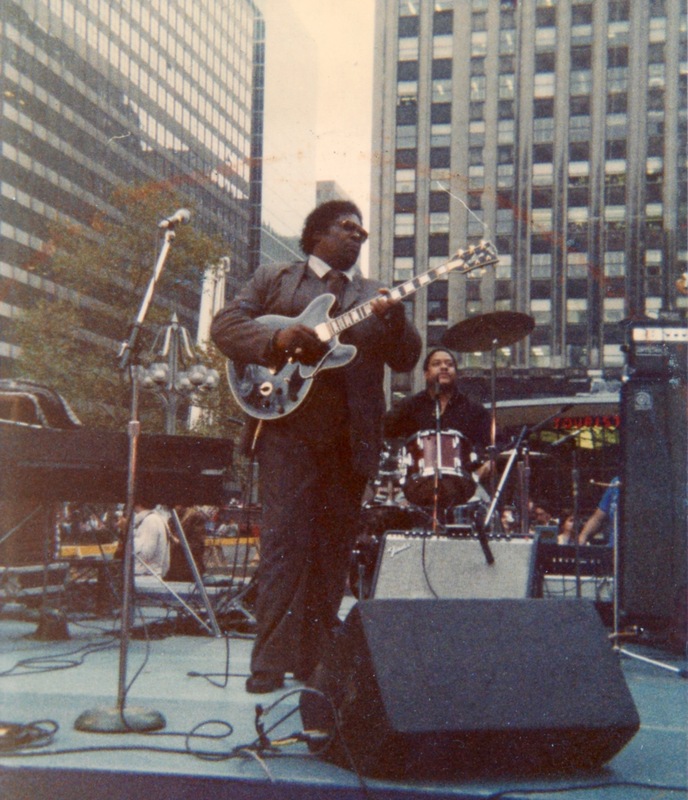 Of Rallies Past: B.B. King, Stephen Stills & … Walter Mondale?! The presidential election of 1984 was the electoral version of a squash match. Think Hulk Hogan battling the “unpredictable” Johnny Rodz or Rowdy Roddy Piper “interviewing” Frankie Williams on Piper’s Pit – that was, to be blunt, President Ronald Reagan v. Walter Mondale. 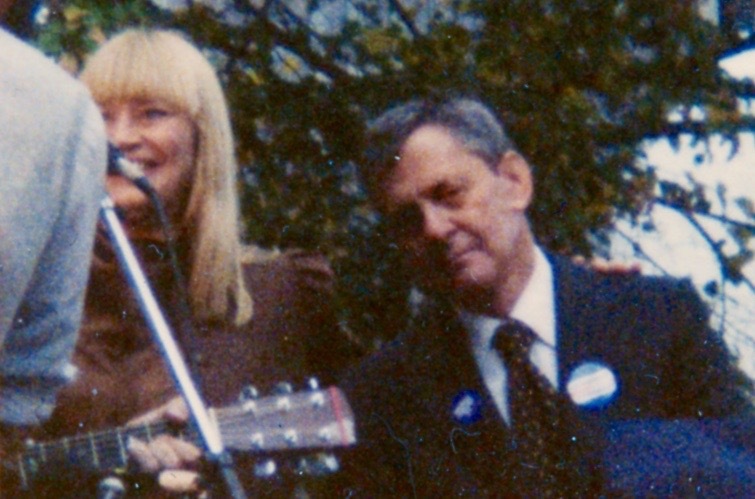 Everyone but the world’s biggest Democratic mark knew who would win the minute Mondale nabbed his party’s nomination. It doesn’t matter. It didn’t matter much to me then, either. I was (and remain) a political creature, but establishment candidates simply didn’t and don’t engender much in the way of passion. At that point in time, Gary Hart was more my speed. (This was pre-Monkey Business, mind you.) He preached a pragmatic approach that many on the left decried as “centrist” while many on the right (predictably) called “liberal.” He recognized, he said, the need to rein in government spending, reform the military, reduce unnecessary regulations and maintain a social-safety net for those in need. He was prepared to piss off both ends of the political spectrum, in other words. Whether that was true, I don’t know. Politicians of all persuasions make promises they won’t or can’t keep. 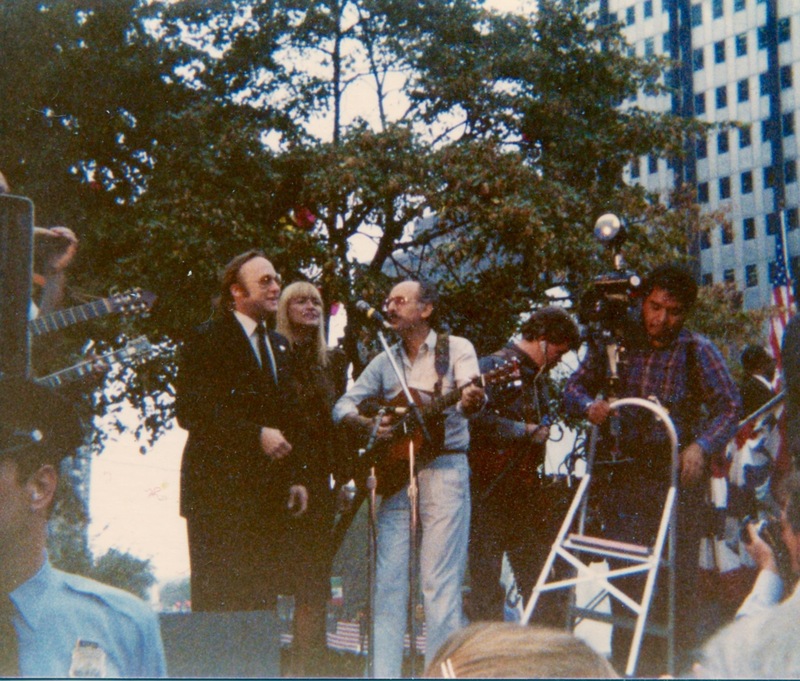 But this I do know: I was 19 that fall, and knee-deep into the music of Crosby, Stills & Nash. 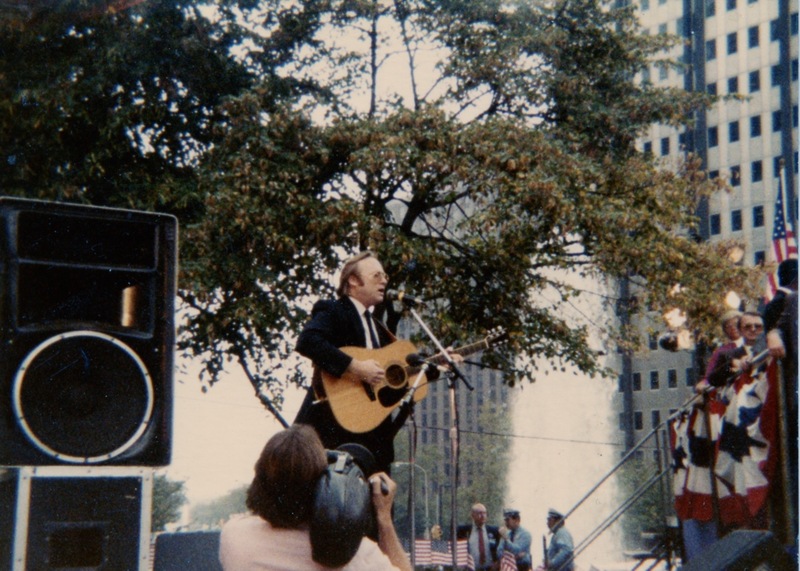 And, lo and behold, Stephen Stills was slated to appear at a Walter Mondale rally at JFK Plaza in Philadelphia on Oct. 22, 1984, the day after the second Reagan-Mondale debate. Also on the bill: B.B. King; Peter, Paul & Mary; and, for some odd reason, Tony Randall. I took the train into Philly, wandered around until I found JFK Plaza and managed to park myself in front of the stage – as the photos show. I don’t remember much of the event beyond this: B.B. King came out first and blazed an electric set of songs that I’d never before heard, including – I think – “The Thrill Is Gone.” Stills was up next, acoustic guitar in hand, and his set consisted of “Change Partners,” “Teach Your Children” and – possibly – “Daylight Again” and “Word Game.” I’m uncertain about those last two. Peter, Paul & Mary completed the warm-up with some of their greatest hits – which hits, however, I can’t say. They’ve been lost to time. Also lost: pictures. I dropped my camera at some point, the back popped open and the film spilled out. Some photos were not exposed, but many were. 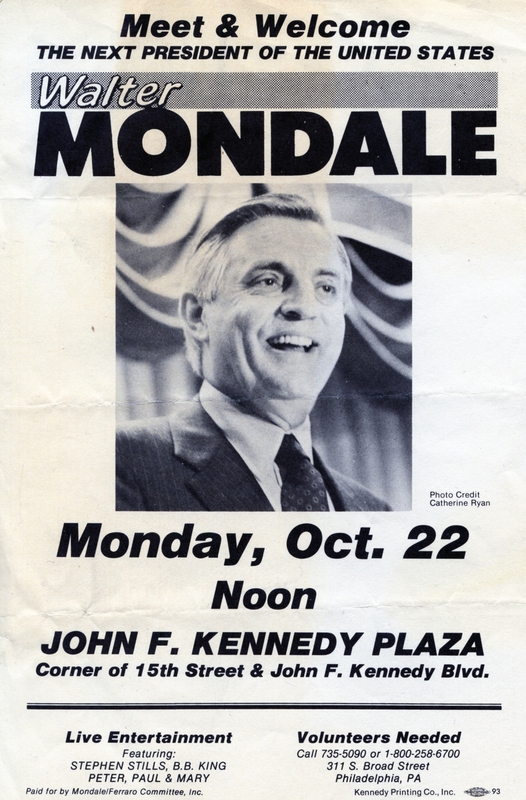 Most of the audience scattered afterwards, but it soon became apparent that quite a few of us descended on JFK Plaza not to hear Mondale, but to see (and hopefully meet) the performers. Stills, for instance, came out, signed autographs – including one for me – and basically held court with about 20 or 30 fans. I said he should have done “For What It’s Worth”; he shook his head and said, “I’d need a piano for that.” He seemed like a nice guy.